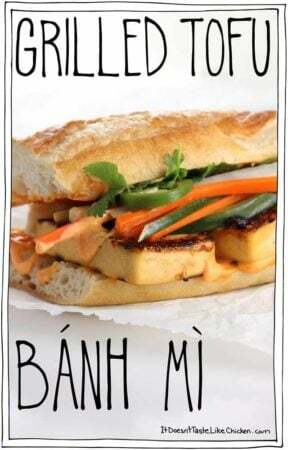 Layers of seasoned grilled tofu, a creamy spicy spread of homemade Sriracha mayonnaise, sweet salty and crunchy pickled veggies piled high, garnished with fresh cilantro and jalapeno, all on top of a soft chewy baguette. 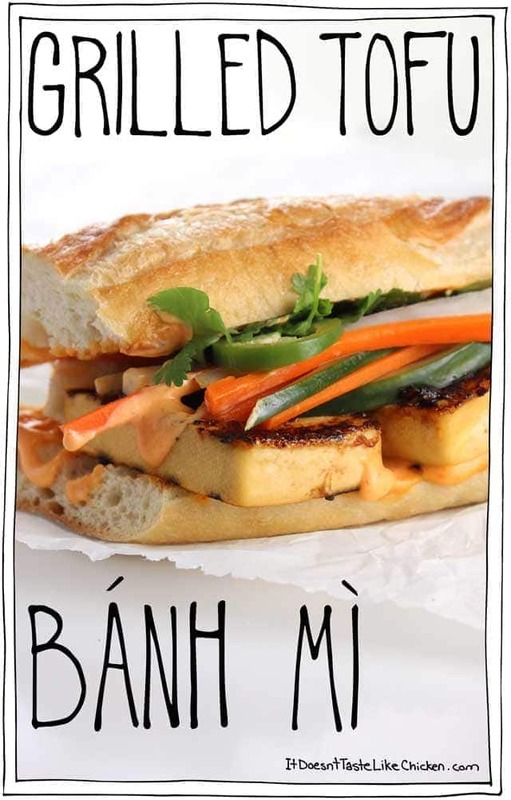 ← THIS is the king of sandwiches, and it’s called Grilled Tofu Banh Mi. Once you have a fluffy baguette it’s all about layering sweet and salty pickled veggies, and (in this recipe) glorious grilled tofu, with a hearty smear of Sriracha mayonnaise. I mean, what more could you ask for in a sandwich? 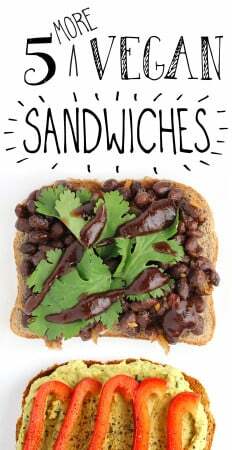 THIS is my new favourite sandwich for the summer with its explosions flavours and textures. I just can’t get enough! 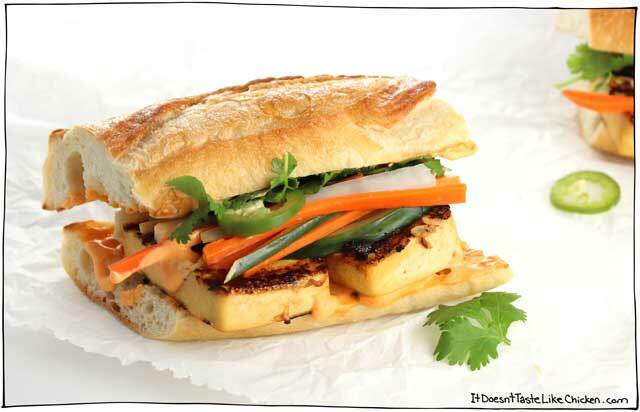 To make Grilled Tofu Bánh Mì: start by draining and pressing the tofu for at least 15 minutes. 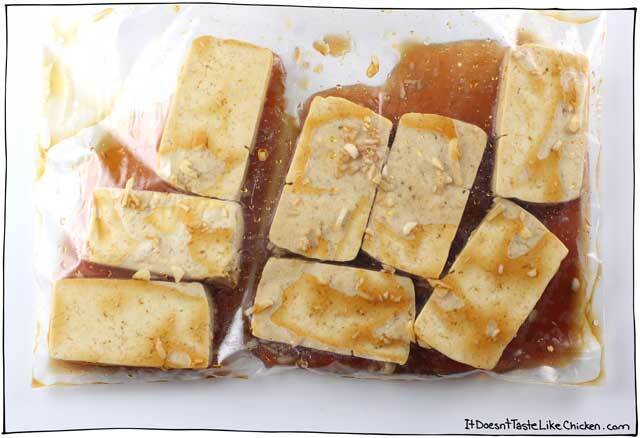 Then toss the tofu in a bag or a covered dish with the marinade ingredients. You can let this marinate for 15 mintues, or toss it in the fridge to marinate for up to 3 days. 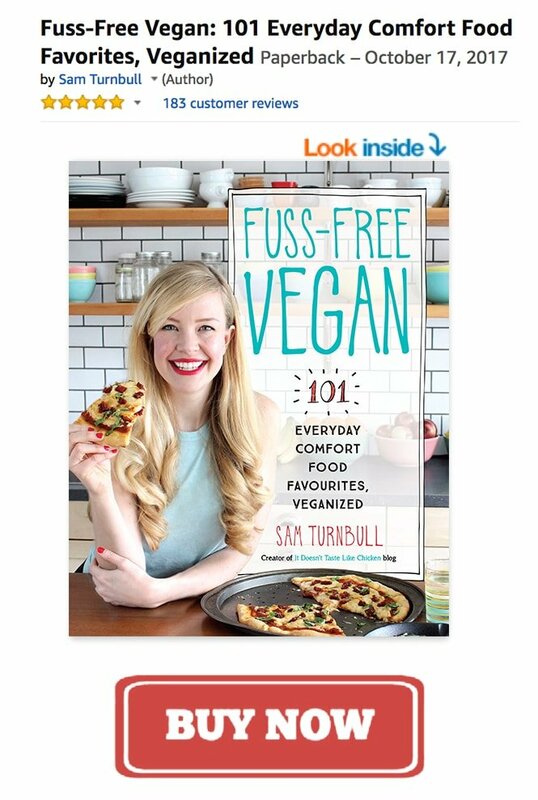 I love this because if I don’t use all the tofu in one go, I have tofu in the fridge at the ready! Once marinated, grill the tofu a couple minutes per side until it’s browned and even lightly charred on some bits. For added flavour, as it’s cooking brush on a leftover marinade. I used a grill pan for my tofu, but you could also use your barbeque. If you don’t have either of those just fry the tofu in a skillet with a bit of oil. I also like to toast my bread by throwing it on the grill for a few minutes. 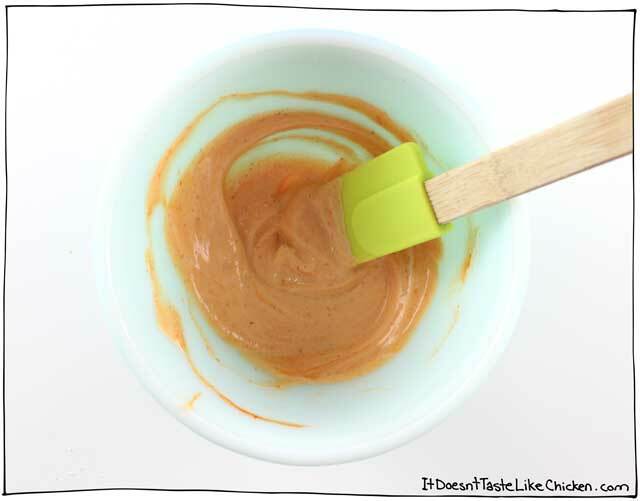 Make the Sriracha mayonnaise by simply mixing together vegan mayonnaise with the sriracha. Sometimes delicious things are just so very easy! If you aren’t a fan of spice, just skip the Sriracha and use plain vegan mayonnaise. 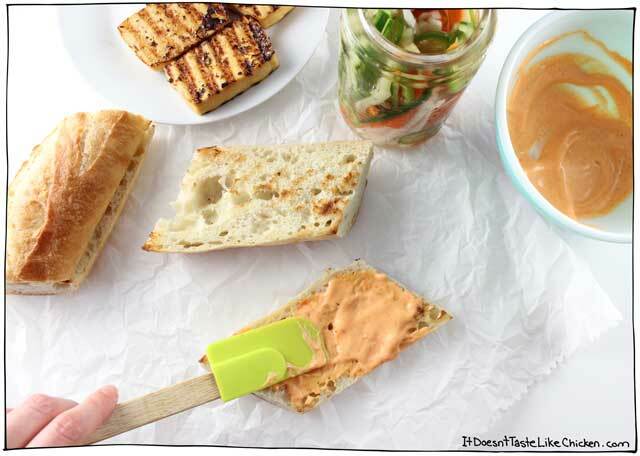 Now assemble your grilled tofu banh mi. 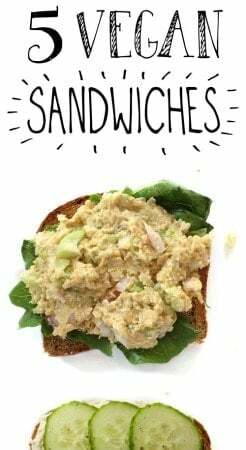 Spread on a thick layer of Sriracha mayo, top that with the grilled tofu, add a big pile of pickled veggies, and garnish with cilantro and jalapeno. Napkins at the ready? Dive in! Drain and press the tofu for at least 15 minutes. You can follow the ultimate guide for pressing tofu here. 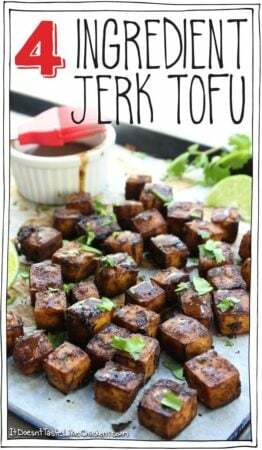 Cut the tofu into 8 slices, then toss the tofu in a bag or a covered dish with the all marinade ingredients, the lime juice, soy sauce, agave, and garlic. You can let this marinate for 15 mintues, or toss it in the fridge to marinate for up to 3 days. 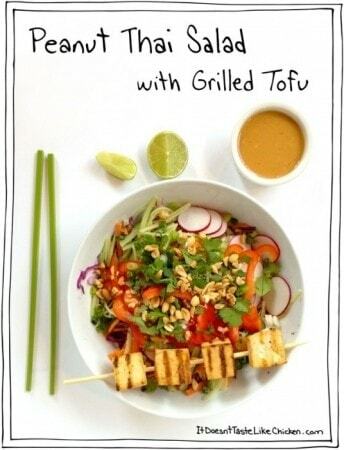 I love this because if I don’t use all the tofu in one go, I have tofu in the fridge at the ready! 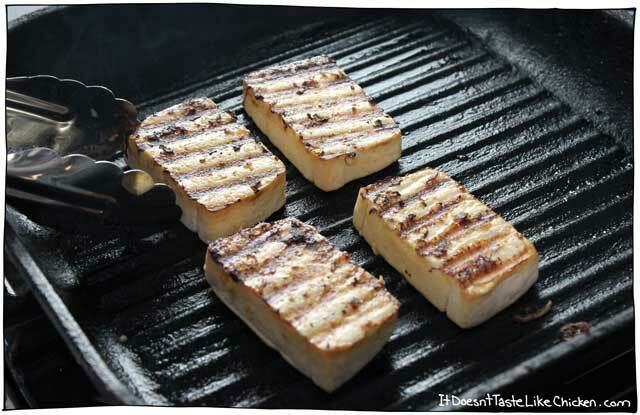 Once marinated, grill the tofu a couple minutes per side until it’s browned and even lightly charred on some bits. For added flavour, as it’s cooking brush on a leftover marinade. I used a grill pan for my tofu, but you could also use a BBQ. If you don’t have either you can fry the tofu in a skillet with a bit of oil. I also like to toast my bread a bit by throwing it on the grill for a few minutes. Make the Sriracha mayonnaise by simply mixing together vegan mayonnaise with the Sriracha in a small bowl. If you aren’t a fan of spice, just skip the Sriracha and use plain vegan mayonnaise. 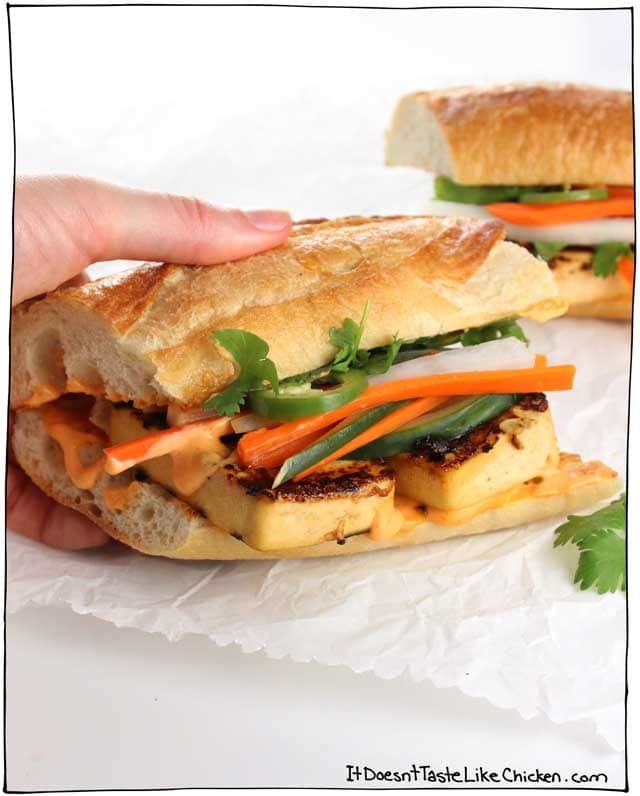 Spread a thick layer of Sriracha mayo, top that with the grilled tofu, add a big pile of pickled veggies, and garnish with cilantro and jalapeno. Delicious! 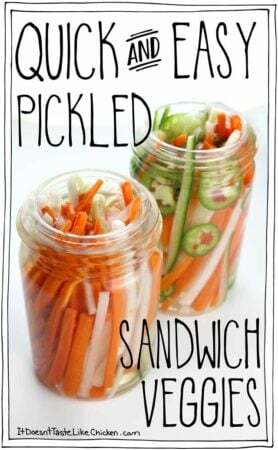 Th pickled veggies are so easy. Thanks for a great recipe! Fast and super yummy – perfect Friday night dinner after a busy week! We added chopped peanuts for extra crunch and an avocado because… well, when in doubt, add avocado :). Thanks! I have NEVER left a comment on any blog or recipe post before. But this sandwich deserves my first comment ever. For the past year or so, this has been on heavy rotation in our house and it easily becomes our favorite dinner of the week. I always marinate the tofu and pickled veggies 2 or 3 days ahead. I don’t know why it’s taken me this long but I just now ordered your book. Can’t wait for it to come in. Thanks for this favorite recipe of ours! You never disappoint. A couple times a week I spend a few minutes at work looking up recipes on your blog and deciding what I want to make for dinner! These were DELICIOUS! Tastes just as good as the banh mi’s i used to get at restaurants before going vegan. You are simply amazing! Just ordered your cookbook and am so excited for your new recipes! I made this as per recipe yeaterday and then tonight for dinner I put the (now very very well marinated) tofu and pickled vegetables on a bed of brown rice instead of using bread. I added some avocado and sesame seeds as well. With the vegan mayo and chili flakes on top it was absolutely to die for. Such amazing flavours in this dish and so versatile! Thanks Sam! Hi Sam! 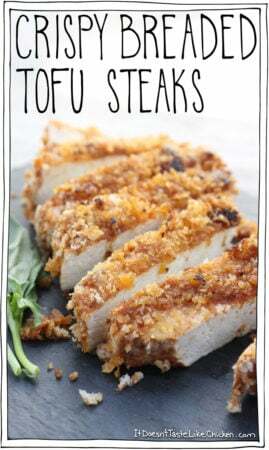 Thank you so much for all your hard work of posting delicious mouth watering vegan recipes! I have followed your website for a while and tried quite a few recipes and they never disapppoint! My husband is on board to be more plant based with me and your recipes definitely make it easier and more enjoyable for us! I can’t stop raving about your website to my husband and guess what, his wedding anniversary gift to me is a shirt from your website with your logo on it! I was so excited when I opened up the present and I will definitely wear it so that more of my friends will know about your awesomeness! Thank you again for being so kind, passionate and talented! I’ve made these twice now…for guests at lunch! Big hit with everyone, including the non-veg folks. DELICIOUS!!! I had left over tofu, and put it back in the marinade overnight. Even better the next day! The tofu really soaked up all the goodness. Oh yum! This sounds delicious! Great recipe Sam!